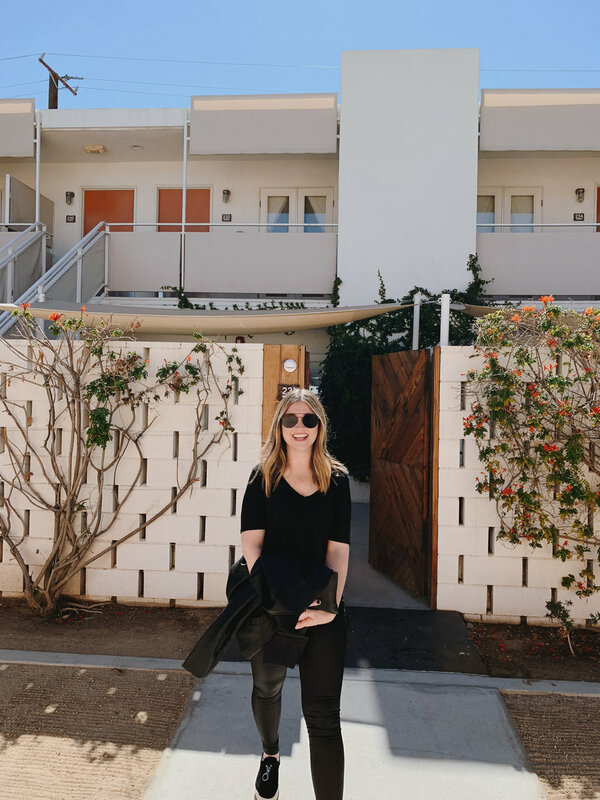 I’ve been lucky enough to visit Palm Springs about six or seven times now, and it honestly never gets old to travel here. I always feel transported back in time, everything is so easygoing and laid back, and I’m in love with that dry desert air. So when my friend Amber decided to join me on a SoCal road trip, I was thrilled be a part of her first trip to Cali! I knew we had to go to one of my favorite places to stay - the Ace Hotel. It’s mid-century, cool, chill vibes are magical! Simply a unique, one of a kind spot. When you enter the lobby, the warm neutral tones, and the giant macrame curtain by artist Michael Schmidt instantly elevate your mood. The front desk staff is incredibly friendly, and are happy to spend a few minutes going over the map of the Ace Hotel. Once checked in, we headed to our room - the Ace Suite! 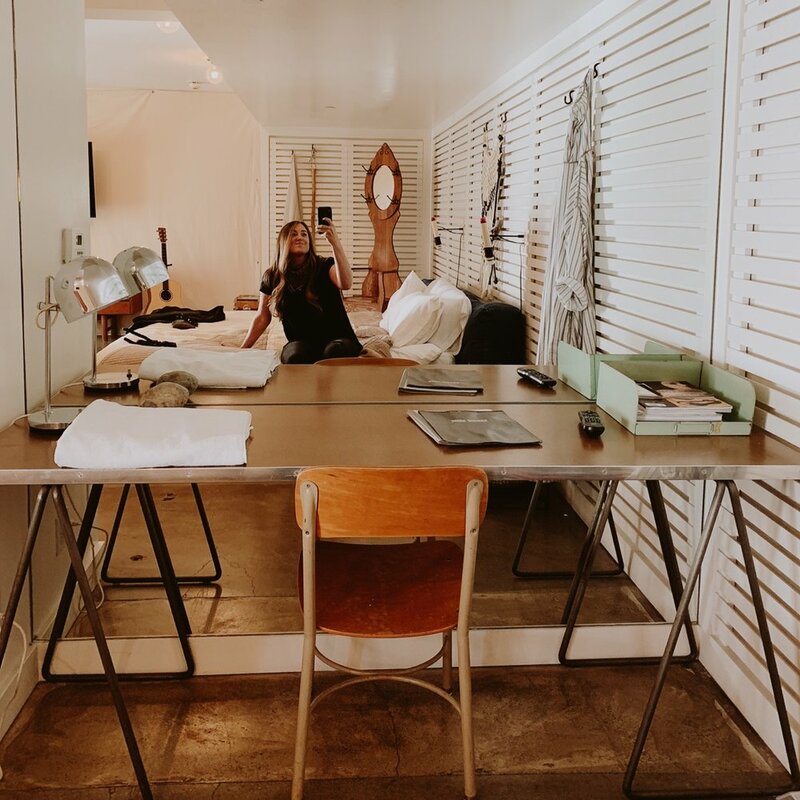 All of the rooms at the Ace make you feel like you are inside a canvas tent, only with a comfy bed, vintage furniture, and a record player. This suite also had a private outdoor patio with comfy furniture to sit in by a fire. It was so fun to watch Amber’s excitement walking into an Ace room for the first time. This photo is from the Ace website - click it to check out hotel room options for your future stay! Mornings are so much better when spent in comfy robes, listening to some vinyl in your room as you get ready for the day. The Ace Suite has a giant bathroom, it’s honestly big enough to be another hotel room. The counter space is so enormous that several girls could get ready together at once (have I mentioned this would be SUCH a fun bachelorette party spot?) And the bath/ shower/ toilet is in a different room. But we especially LOVED the huge outdoor shower, that was surrounded by fruit trees on the outside. We finally headed over to enjoy coffee and avocado toast by the pool. This avocado toast was MASSIVE and could have fed 3 people. There is just something wonderful about the vibe of the pool area, especially with views of the mountains. There are actually two pools at the Ace, and both of them are saltwater pools. I’ve often stayed here on the weekends when they have DJs playing music poolside during the day, but this weekday morning we had the place practically to ourselves. 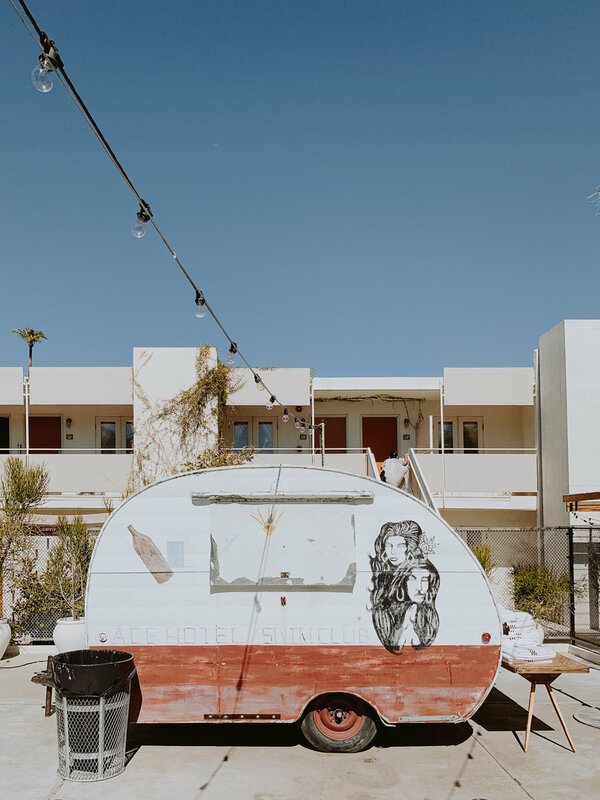 We explored the hotel grounds, took photos in front of their fun mural and old camper, then headed downtown Palm Springs. The Ace is so close to downtown, and you can even rent a bike from them to ride downtown. Lots of lovely shops and restaurants to check out! 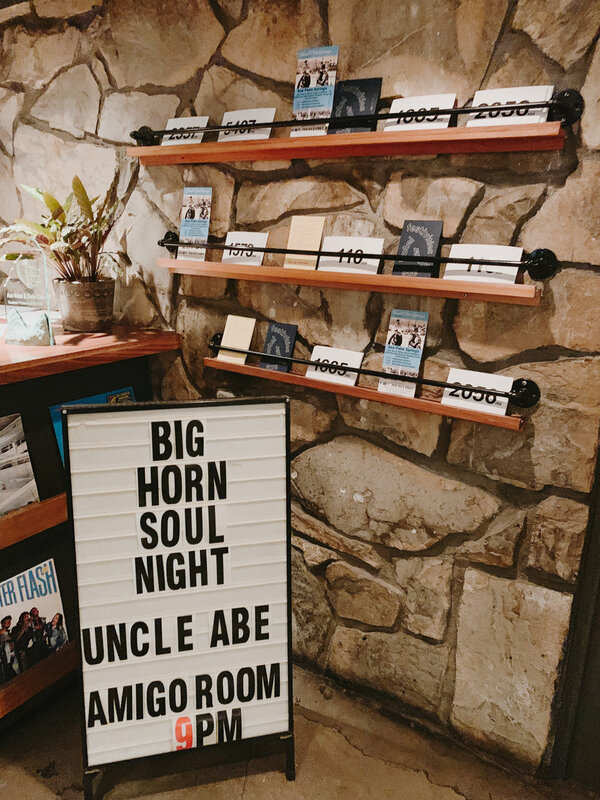 After an afternoon spent exploring, we grabbed a drink at the Amigo Room connected to the Hotel. You can check out their events calendar HERE to see what’s on the schedule. There is usually a DJ, karaoke, or live music happening. Be sure to get a photo in the vintage photo booth! It’s also right next to King’s Highway - a fab Palm Springs restaurant! Food is delicious, their frozen drinks and cocktails are fantastic, and I love that such great spots are just a short walk from our hotel room. After dinner and drinks, we hit the pool, which is open from 6am-2am. We could have stayed there all night, but we decided to go get extra comfy and warm by the fire on the patio. Day or night the patio was such a great spot! We were sad to pack up and leave the next morning, but it was time for another stop on our SoCal Road Trip together. 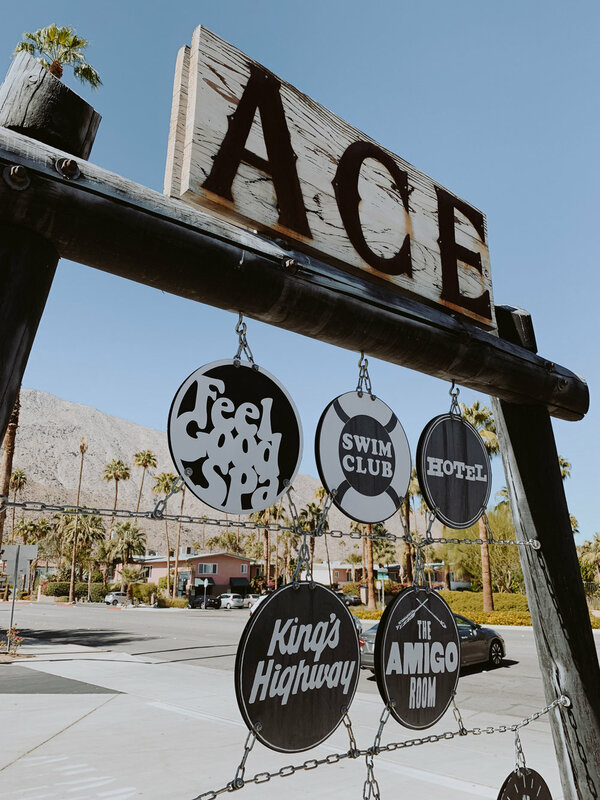 I highly recommend going to Palm Springs, and staying at the Ace! I personally like to go anytime October-February when it isn’t super hot. 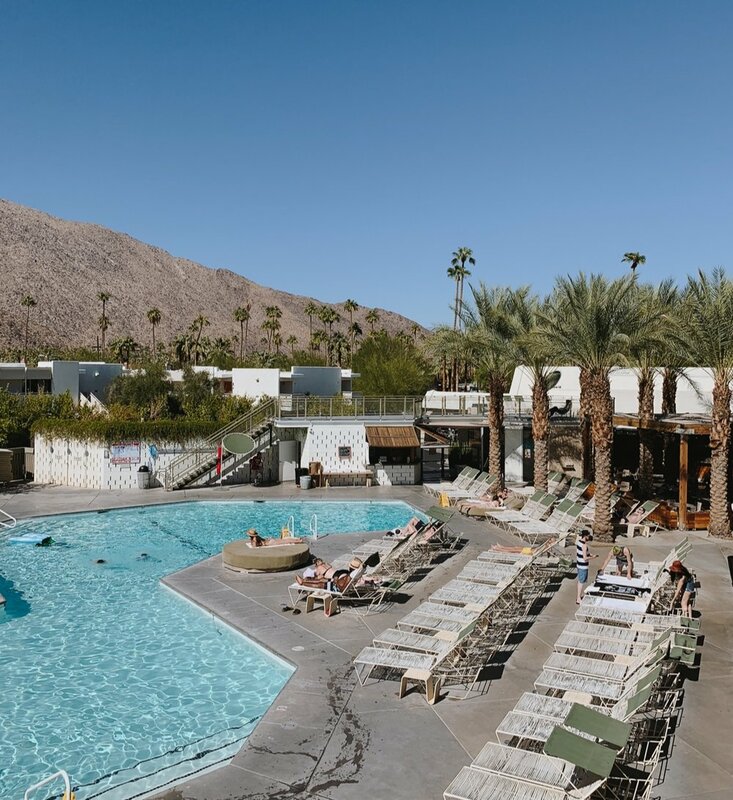 I love how it’s warm during the day, but at night you can cozy up by the fire :) Have you been to Palm Springs? What is your favorite place to stay? Sign up with your email address to receive the latest blog and fun exclusives!